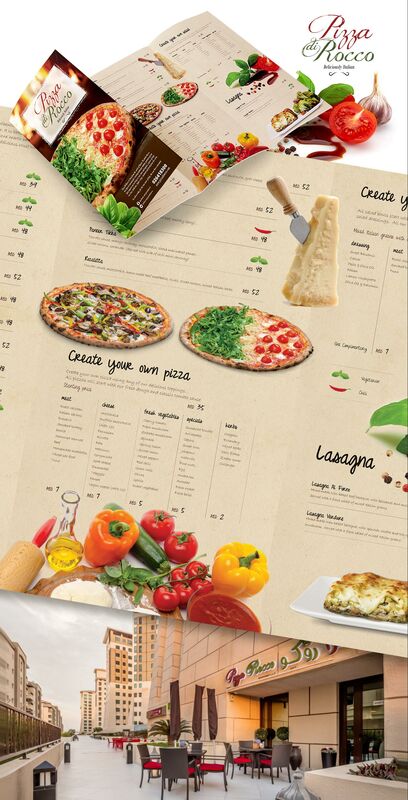 The award winning pizza delivery company in Abu Dhabi, Pizza Di Rocco, worked with Smart to create their menu design. Being such a prestigious company, the menu design had to show the premium quality of the business. The project also posed the challenge of creating a design for two different menus based on languages. As a well established company, Pizza di Rocco already had a strong brand. Because of this, the menu design needed to fit in seamlessly with their well known identity. By working with the team at Pizza di Rocco and conducting research on the company and competitors, we were able to gain an understanding of what was needed from this menu and how it needed to look. By using a clear layout, setting the most important meals in the centre of the page and working our way out, the menu manages to establish a connection with the reader and guide them through. The strong and colourful imagery is used to great effect, not only showing the customer what the dishes look like, but introducing them to each section. Finally, the design was incorporated in to a digital version which was made to be easier to read on a digital device. The resulting menu design allows Pizza di Rocco to establish new customers and reach out to old customers by giving them a multi-platform menu presentation.